We had a frost warning a couple of days ago, and it's currently pouring rain. So I guess that means it’s time to break out those rich, delicious and comforting fall flavours – spice, pumpkin, rich stews and braises. YUM. I’ve got a few things in the freezer that are begging to be braised. Can’t wait. One of the fall flavours I like most is pumpkin. I freaking looooooooove pumpkin pie (it’s a borderline obsessive relationship, much to the dismay of hubs, who thinks it’s gross). Clearly he is wrong. 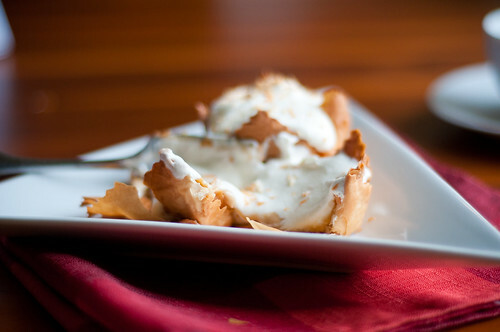 Imagine a torrid culinary affair between pumpkin pie and coconut cream pie. This is their love child. 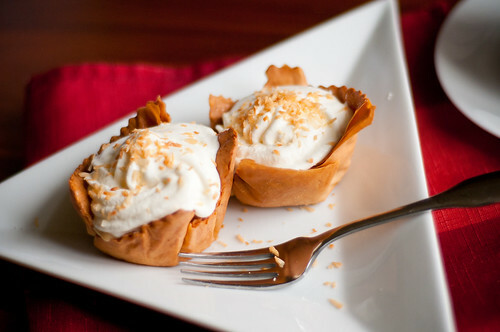 Delicious and delicate pumpkin-coconut cream phyllo tartlets. 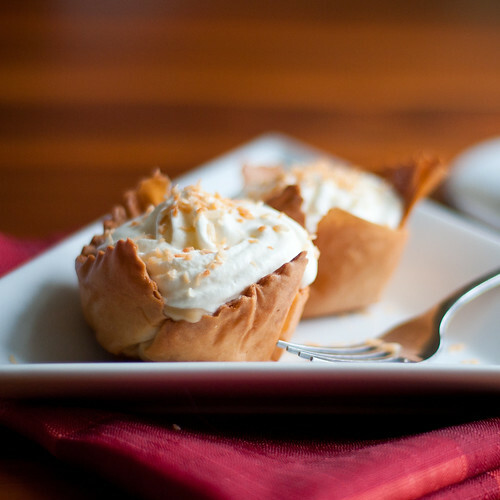 It’s so light and so amazing….the buttery browned phyllo just crackles apart with every bite, and the creamy pumpkin-coconut filling spills out, topped with lightly-sweetened whipped cream and the slightest touch of toasted coconut. I had never made tarts with phyllo before, but I’ll absolutely be doing it again. I’ve written COUNTLESS times just how much I hate working with pastry dough, and while you can buy tart shells, these cute little phyllo guys are super easy, impossible to screw up, and they look and taste phenomenal. Even better, hubs had made tourtiere phyllo triangles over the weekend and I had precisely 5 sheets of phyllo left. I found the pumpkin filling to be a bit runnier than I would have liked. I might increase the cornstarch a touch (maybe a ½ T) and cook just a bit longer. I was expecting more of a pudding consistency, rather than a sauce. This dessert can easily be made in advance (case in point: I made these yesterday and took pics today; the crust was just as explosively flakey, and the only casualty was that my whipped cream wasn’t holding its shape as well today). The only caveat is that they must be assembled at the last minute. But if you have the tart shells ready to go, it just takes a few minutes to spoon in the filling, pipe/spoon the cream and sprinkle the coconut. 1. To prepare filling, whisk eggs with 3 T sugar and pumpkin pie spice in a medium bowl. 2. In a small saucepan, whisk remaining 3 T sugar with cornstarch. Slowly whisk in coconut milk until evenly mixed. Set over medium heat. Bring to a simmer, whisking occasionally (I would bring it to a gentle boil). 3. Very, very slowly, pour some of the hot coconut mixture into the eggs, while furiously whisking (this tempers the eggs so you don’t end up with scrambled eggs). Once you’ve poured about half the coconut stuff in, take the egg/coconut mixture, and whisk it BACK into your coconut pot. Set back over medium heat. Whisk until it comes to a simmer and thickens a bit. 4. Remove from heat. Whisk in butter, vanilla and salt, then pumpkin puree, until evenly mixed. Pour into a bowl and press plastic wrap onto surface. Refrigerate until chilled. 5. To prepare pastry, preheat oven to 325F. Grease a 12-cup muffin pan. Unroll phyllo onto counter. 6. Cover with damp kitchen towel. Carefully remove one sheet to counter and recover stack of pastry with towel. Lightly brush single sheet of pastry with butter. Sprinkle with about 1 t of sugar. Top with another sheet of phyllo (try to line up edges). Repeat until you’ve used all sheets of phyllo. Cut into 12 even squares (I used a fancy pastry cutter, but a pizza cutter works great, as will a sharp knife). 7. Press squares into muffin tin. Bake in centre of oven for 10-12 minutes, or until golden (after 10 minutes, I turned the temp up to 400F and cooked another 2, because I wanted mine nice and toasted; watch closely though because burnt phyllo is bad news!). Remove to a rack and cool completely. 8. Toast your coconut (I toasted mine in a dry frying pan; you could use the oven as well). Again, watch closely because it will go from toasted to burnt very quickly. Let cool. 9. Beat whipping cream until soft peaks form. Add sugar and coconut extract, then continue to whip for stiff peaks. 10. To assemble, spoon filling into each cup. Top with cream. Sprinkle with coconut. Serve immediately. Because I had so much pumpkin left after this was done, I also made some pumpkin muffins. 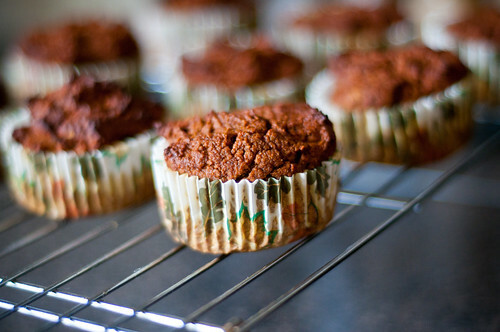 Check out this tasty pumpking-gingerbread muffin recipe from the Paleo Mom. They aren’t overly sweet and fit the bill perfectly for Lil Z’s school snack – nut-free, healthy and yummy. Oh so pretty! I love how you combined two desserts into one. Yum!